The standard Bollinger Bands indicator is used for generating signals. All operations are performed according to formed bars on the current timeframe. The Expert Advisor can be used for semi-automated trading. Positions can be closed manually but trailed by the EA. 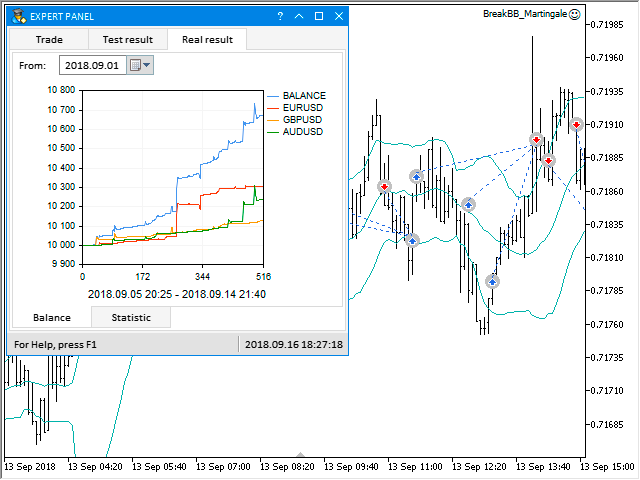 Since the martingale method can be dangerous, you can close the position manually when the current profit becomes greater than previous losses. It is recommended to select parameters for each account type separately. The EA features a control panel for emergency closure of all open positions or only for the specified symbols. 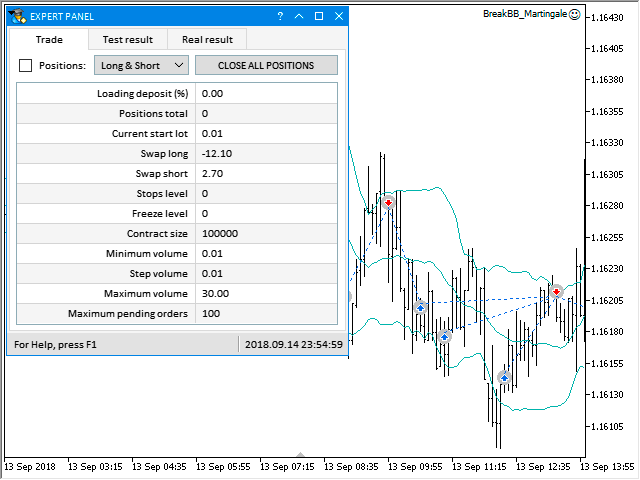 In the control panel, it is possible to specify the direction to open trades. The EA's graphic interface contains a table with the statistic values of last testing results and parameters used during that testing, as well as a table with the current account statistics. Start hour - hour to start trading. End hour - hour to stop trading. Trade weekdays - days of the week for trading. Indicator period – period of the Bollinger Bands indicator. Deviation – this parameter sets up a deviation of the channel borders of the Bollinger Bands indicator. 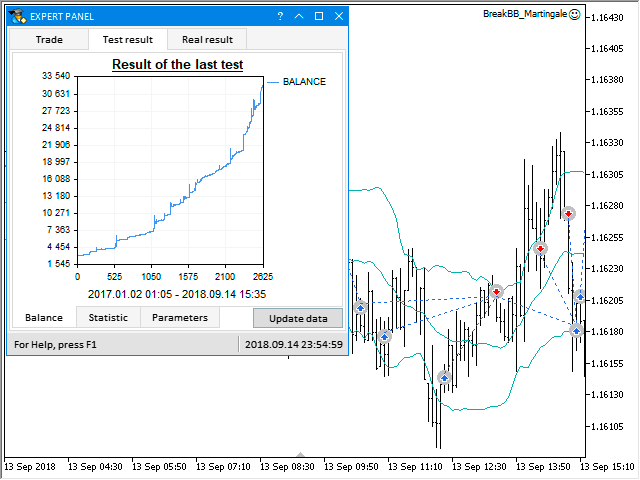 Tick mode - if set to true, the management of trailing stop and transfer of stop loss to breakeven will be performed and tracked by tick events. Take profit – distance in points from an entry point to the level of fixing a profit. Stop loss – distance in points from an entry point to the protection level. Trailing stop – step in points used for modification of the protection level in the profitable direction. Reverse – in this parameter, one can specify if positions will be reversed in case an opposite signal appears. Break even stop loss - distance in points that a price should pass to set the Stop Loss to breakeven. Break even offset - a distance in points at which Stop Loss will be placed in the breakeven level relative to the current position price. Delta – the amount of profit, after which the initial lot is increased by the specified step. Start lot - initial lot. Step lot - lot step. Increase coefficient - averaging the position by the coefficient. Martingale coefficient - if a position is losing, the volume of the next one will be multiplied by this coefficient. Custom max - custom criterion for finding parameters during optimization.